Tucked away down a winding path just off Third Street, Cosmic Depot looks like the home of the friendly neighborhood witch. A black cat named “Shadow” roams between the butterfly-bedazzled shrubbery and the bright yellow house speckled with purple stars. Inside, the shop is bursting at the seams with all manner of metaphysical, esoteric, and New Age spiritual accoutrements. But in addition to the expected—singing bowls, crystals, incense, dream catchers, statuettes of Hindu deities, essential oils, glass pipes and vaporizers, Grateful Dead paraphernalia, tarot cards and tapestries—the shop also has items that appeal to a more mainstream set. The Cosmic Depot attracts people of all ages, from 80-year-old grandmas to wide-eyed babies, says owner Christy Graham. The one quality that connects them, she explains, is an open mind. One of the shop’s highlights is an extensive jewelry selection, hand-picked by Graham, which includes radiant gemstone rings and necklaces in a variety of hues. 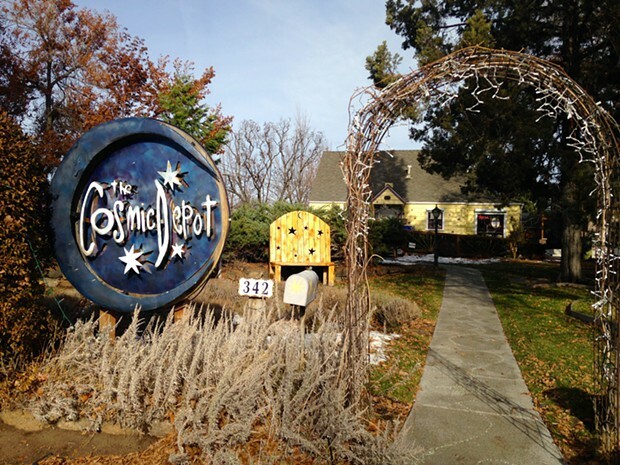 Cosmic Depot also carries handcrafted items made by artists from Bend to Nepal—including felted birdhouses, glassware and wands—as well as DIY terrarium kits and air plants for aspiring green thumbs. “I have a real passion for helping people create beauty in their own lives in whatever way I can,” Graham says. For younger customers (and the young at heart), Graham stocks gifts and novelties such as ant farms, jaw harps, glow-in-the-dark ping-pong paddles, fart machines, and excuse generators. Graham says she realizes that the products she sells may be found online, but emphasizes that Cosmic Depot offers both a unique assortment of items and a level of customer service that can’t be found on Amazon.com. And like so many small business owners, she drives home the point that money spent in the community circulates in the community, supporting not only shop owners but the goods and services they purchase.